Chazon Children's Center is situated in Molo, Kenya, a town 220 kilometers northwest of Nairobi. Since 2007, the Center has provided quality education and meals to a growing number of orphans and vulnerable children. Before AHEAD began working with the school, there was no electricity and water was being hauled by hand up a steep hill. Chazon Children’s Center was founded by Lucy Njenga and Samuel Kimathi, a husband and wife team of ordained ministers, in response to the need to provide schooling to orphans and other children displaced by tribal violence in Kenya. Samuel and Lucy sold much of their own property to purchase land on which to build a school and to hire teachers. To date, four classrooms and a cooking shed have been built. Each classroom is divided so that eight grades can be accommodated. Dr. Virginia Duffy, a psychiatric nurse practitioner from Rochester, New York discovered the school on a trip to Kenya in 2009 and made a commitment to assist the school with various needs. Of particular concern was the need for irrigation and improved energy systems. Working with Dr. Duffy, AHEAD has helped the school obtain a Kickstart pump to irrigate crops being grown at the school to feed the children. CCC is attempting to grow most of the food for their current student body of over 200 pupils as purchasing food for so many children is not financially possible. For some children the meals provided at CCC is the only food they receive each day. 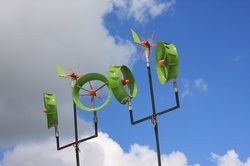 AHEAD also made the arrangements for six wind turbines, manufactured and donated by Jetpro Technology (a Taiwanese renewable energy manufacturer), to be installed at the school in 2010. A local electrician and an American expatriate working for the US State Department installed and tweaked the system. The electricity is supplying lighting for the school, which is often needed during the rainy season to see indoors and is also critical for security at night. It also allows for the use of computers for student and teacher learning, improved record keeping, and communication. Moreover, the electricity is being used to charge lights (also donated by JetPro) that students take home at the end of the school day so that they have light to study by at night. Virtually none of their homes have electricity. For more information about Chazon Children’s Center log on to http://chazonchildrencentre.blogspot.com and http://chazonafrica.org/ourstory.html.